Hair Thickening Grooming Cream - Medium Hold, 5.0 fl oz (Every Man Jack) - Penn Herb Co. Ltd.
Get the look-and-feel of the fuller hair you want with this lightweight cream. Keratin and soy protein fortify from root to end, giving hair a natural, touchable hold that’s never stiff or crispy. Our products give you exceptional performance using only naturally derived ingredients. No parabens, no phthalates, no dyes, and never tested on animals. Aqua/Water/Eau, Emulsifying Wax NF, Cetearyl Alcohol, Hydroxyethyl Behenamidopropyl Dimonium Chloride, Cetrimonium Chloride, Tribehenin, Hydrolyzed Soy Protein, Polyquaternium-28, Panthenyl Ethyl Ether, Hydrolyzed Keratin, Melaleuca Alternifolia (Tea Tree) Leaf Oil, Saccharum Officinarum (Sugar Cane) Extract, Citrus Medica Limonum (Lemon) Fruit Extract, Pyrus Malus (Apple) Fruit Extract, Camellia Sinensis (Green Tea) Leaf Extract, Aloe Barbadensis Leaf Juice, Hexapeptide-11, Hydroxypropyl Guar Hydroxypropyltrimonium Chloride, Betaine, Hexylene Glycol, Citric Acid, Butylene Glycol, o-Cymen-5-OL, Fragrance/Parfum. 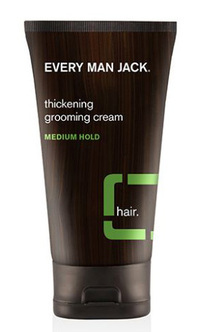 Every Man Jack hair styling products will keep your hair looking healthy and never dry, flaky, or dull. Work small amount through wet or damp hair. Tip: Use on dry hair for added definition and control.